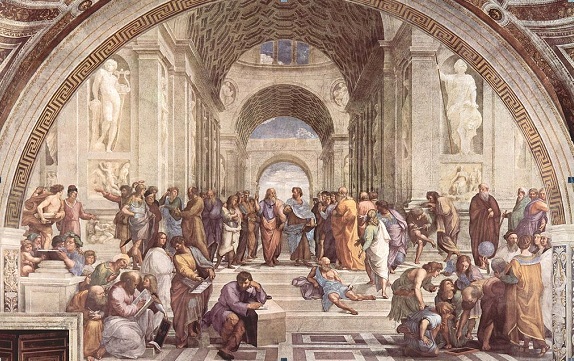 The School of Athens by Raphael in the Apostolic Palace, Vatican City (1509-1510), depicts the pursuit of knowledge. Plato can be seen on the left at the paintings centre. Answering ‘yes’ to this question asked by this magazine, evokes a utopia with endless possibilities and no worries. Yet, perhaps humankind is bound to be shackled. Nevertheless, we could strive for this utopia. The question is how. Today humankind has conquered physical nature for the most part and freedom is largely defined as a political concept by Western liberal ideology. Hereby, each citizen ought to be free within the limits of the necessary conditions that allow society to function. Additionally, the state should provide and protect this freedom. This idea originates from late medieval to early contemporary philosophers who, after antiquity, started to fundamentally rethink the concept of freedom and the structures of society. Hobbes, Locke and Rousseau are just a few of the prominent representatives who contributed to establishing modern political thought on how societies could be constructed, instead of accepting traditional structures of a God-ordained order. One classic, yet negative example of being ‘free in freedom’ might be found in the work of Thomas Hobbes, The Leviathan. According to his political philosophy mankind is, from the onset, free and equal. This ‘freedom of all’ actually has macabre consequences. Since everyone is free, each will pursue the utmost freedom, that is, the fulfilment of as many his or her desires possible. However, there will be human needs which will be fought over because either, they are not available in abundance, or cannot be distributed in separate entities but only as a collective, such as a water source. As a result, being free in freedom means anarchy and conflict: man is constantly exposed to the threat of the freedom of others. A system of order needs to be established by a supreme ruler, so that everyone can fulfil as many desires as possible. John Locke contested this idea of a supreme ruler and made property the basis of freedom and society. The natural right of man is property through labour, which enables him or her to be free. According to Locke there should be a supreme government, which does not go against the natural right of property or against the opinion of the majority, as this could lead to its dissolution. Jean-Jacques Rousseau stated that each person needs to be both sovereign and subordinate, that is – a citizen – participating in both making and adhering to the rules results in free will and freedom. Out of the complex variety of individual interests, theoretically an absolute general interest would always emerge. Consequently, the power of the sovereign needed no limits as it would be in favour of that general interest. This idea stimulated an enormous state building process. These are the states we still live in today in Europe: the state takes care of people’s lives from the cradle to the grave. In any case, the modern understanding of freedom as the sum of opportunities created to consume and possess in order to make life as pleasant as possible was developed. 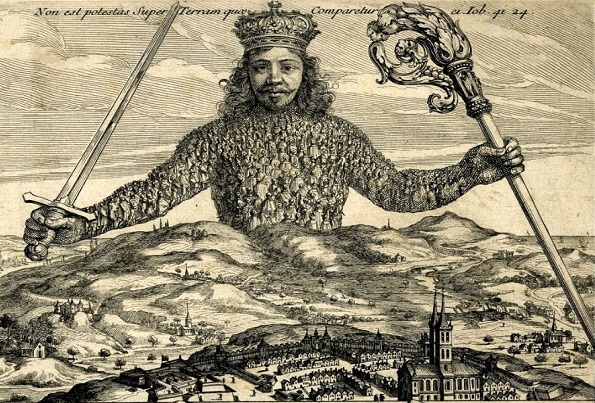 Front image of the work of Thomas Hobbes, The Leviathan (1651) by Abraham Bosse. Nevertheless, we can criticise this concept of freedom. If we look back at Classical tradition and Christian thought, the above mentioned concept of freedom does not reflect freedom at all. ‘Free in our freedom’ would mean an everlasting pursuit of material gain, fulfilment of desires and hedonistic behaviour. According to Classical tradition this will only result in apparent freedom. The consequence could be an everlasting pursuit of insatiable desires, addiction, dependency, disappointments and emotional rollercoasters. As when one materialistic or hedonistic desire is fulfilled, another will come to the surface. The only real freedom can be gained if we are able to control our desires, wishes and emotions. Stoic philosophy for example states that you are free if you accept that you just need your thoughts – especially ‘a peace of mind’ (apatheia) in the face of life’s highs and lows. All possessions and relations cause dependency and make man unfree – either a slave to someone else or to himself. According to Plato, the highest goal we can achieve in life is happiness. Therefore, freedom is only worthwhile as a means to achieve happiness. At the same time acquiring happiness could be the ultimate form of being free in our freedom. Plato states that only the possession of knowledge is permanent. True happiness is therefore achieved in the pursuit of knowledge and truth. According to him the truth is equivalent to goodness. ‘Free in our freedom’ could imply doing whatever one pleases, which is in contradiction to Plato’s understanding that man can only be happy and free when he does what is good. If he does evil it will cause stress, fear, dependency and therefore – no freedom. For example, if you steal from others, the consequence is that you will be suspicious of them stealing from you and you will isolate yourself. At the same time, when the money gained from the theft is spent you would want to steal more and buy more things. It will be difficult to accept the fact that you need to work for money, as it was possible to steal it before. Therefore, you have the risk of losing your freedom both on a social external level as well as on a personal internal level. Thus, according to classical thought there are four cardinal virtues to be followed which will lead to happiness and a state of mind which is free of trouble: prudentia (prudence, wisdom) iustitia (rectitude, righteousness) temperantia (sobriety, restraint) fortitudo, (courage, steadfastness) to which Christian thought added fides (faith), spes (hope) and caritas (love). In any case, to answer the question ‘Are we free in our freedom?’ is to answer if we can bear the responsibility of freedom. We should not only see freedom on a political, material and social level, but also on an emotional, ethical and personal internal level. Three points could express this. Lastly, so as not to fall into a frustrating punitive thought: natural instincts, desires and egoism are part of our lives and we need to accept (or in Christian thought ‘forgive’) the excess from ourselves and others, that could still occur even though we pursue to channel each of our desires, needs and emotions. If each person is their own master in respect to these points, then, perhaps, we could be free in our freedom. 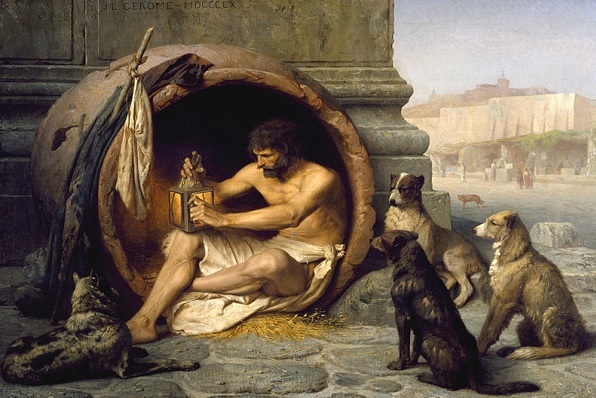 The philosopher Diogenes (404-323 BC) who emphasized austere existence and inspired Zeno of Citium to found Stoic philosophy. Painting by Jean-Léon Gérôme (1860). 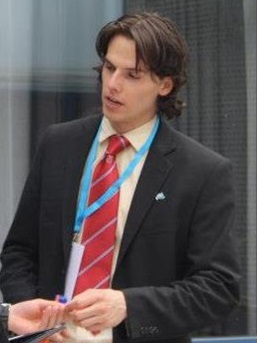 Michiel is from the Netherlands and has a broad academic interest in various topics like history, politics and philosophy. He graduated in History at Leiden University and also studied at the University of Amsterdam and at American University in Washington DC. Currently he is a Master student of Euroculture at the University of Groningen and Göttingen. Next The Mariinsky Theatre – My Personal Tiffany & Co.